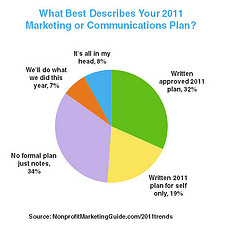 Is your organization one of the 49% of nonprofits who said they have no formal marketing or communications plan for 2011? If you are still developing your plan or are curious to see what other nonprofits are planning this year, you should have a look at the 2011 Nonprofit Communications Trends Report. Conducted by Nonprofit Marketing Guide.com, the report is based on a survey of 780 mostly small to medium-sized nonprofits in North America in December 2010. The 2011 Nonprofit Communications Trend Report found that only 51% of nonprofits said they have a written marketing or communications plan for 2011; another 34% have informal notes; 8% said their plan lives "only in their heads" and another 7% plan to "do what they did last year." The survey listed 14 communications tools and asked respondents to select up to three that were "most important," "somewhat important," and "least important." When the "very important" and "somewhat important" rankings were combined, it became obvious that online marketing tools dominate, tumping more traditional forms of nonprofit communications." Kivi Leroux Miller, president of Nonprofit Marketing Guide, notes that "while Twitter (34%), blogging (27%), online video (26%, photo sharing (11%) and audio-podcasting (6%) did fall far behind the top 6 communications tools, many nonprofits do rely on blogging, video, photo sharing and podcasting to keep their website, email and Facebook pages fresh and engaging." Nonprofit communicators are excited about new ways to connect with their supporters, their increasing use of social media and better communications planning and integration. Nonprofit communicators are scared about economic uncertainty, the difficulty of implementing marketing strategies and the lack of staff time for communications. To gain more insight into trends for nonprofit communications this year, you can download a free copy of the 2011 Nonprofit Communications Trends Report. By completing our brief Reader Survey (only 9 questions), you'll help us provide relevant information in future blog posts. 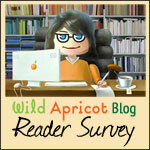 The Reader Survey will be online until January 21st, so please take the survey and have your say! Thanks for covering the report! Being a market researcher, I went directly to the report. No surprise that emarketing and a website are considered “very important” to more nonprofits than any other marketing tools. Based on Nonprofits and Social Media: It Ain’t Optional (http://www.ventureneer.com/sites/default/files/nonprofits-and-social-media-it-aint-optional_0.pdf), it’s my prediction that nonprofits are just beginning to realize that they need to devote time to social media. Once that realization sets in, nonprofits will become more proficient in Facebook, Twitter, and videos and their social media efforts will become both more effective and more important. Print and in-person events will become fade as tools for getting the word out. Geri: Thanks for your insight.